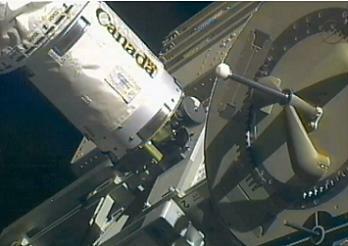 Canada’s multi-tasking robot, Dextre, successfully removed the CATS (Cloud-Aerosol Transport System) payload from the unpressurised trunk of the CRS-5/SpX-5 Dragon on Thursday morning. The payload was handed over to the Japanese Experiment Module, Kibo, marking the first “handover” between the Canadian robot and the JAXA arm. The latest SpaceX Dragon arrived at the orbital outpost on January 12, following her successful launch atop the Falcon 9 v1.1. Following the berthing the spacecraft to her new home on Node 2, the crew began removing the array of supplies that included 490 kg (1,080 lb) of provisions and equipment for the crew, 717 kg (1,581 lb) of station hardware and 577 kg (1,272 lb) of scientific hardware carried within the pressurized section of the Dragon capsule. However, Dragon has many strings to her bow, with the ability to carry specific payloads within the unpressurised trunk section. For CRS-5, the CATS (Cloud-Aerosol Transport System) payload rode uphill inside the trunk, ahead of being installed in its final destination on the Japanese section of the Station. Removing payloads from the Dragon’s Trunk is the responsibility of Canada’s space robot, the Special Purpose Dexterous Manipulator (SPDM), better known as Dextre – which arrived aboard Shuttle Endeavour during the STS-123 mission. The robot features two arms, both with shoulder, elbow and wrist joints, although only one arm can be used at any one time. Both arms are terminated with ORU Tool Changeout Mechanisms (OTCMs), which include “jaws” to grasp objects, a retractable socket drive, a camera and light, and an umbilical connector to provide and receive power, data and video to and from a gripped object. The OTCMs also include Force/Moment Sensor (FMS) technology, giving the arms a “sense of touch”. Both arms are connected to a central body which features a Power & Data Grapple Fixture (PDGF) at one end, which enables the SPDM to be grappled and controlled by the SSRMS, and a Latching End Effector (LEE) at the other end, which enables the SPDM to grapple and attach to other PDGFs on the ISS. 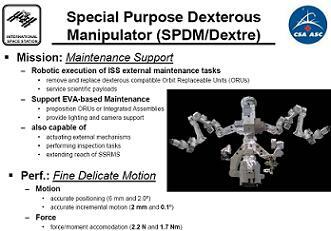 Dextre is multi-talented and has already been used in Robotic Refuelling Mission (RRM) tasks. Dextre and the Dragon spacecraft are no strangers to each other, after an initial meeting during the spacecraft’s debut mission to the Station, testing out clearances and camera views ahead of the future payload removal role. 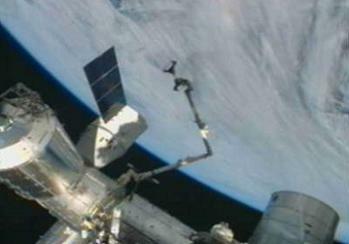 The first hardware to be removed from Dragon’s Trunk came during the CRS-2/SpX-2 mission. However, this only involved the SSRMS, tasked with the removal of two Heat Rejection Subsystem Grapple Fixtures (HRSGFs) – which are essentially bars each featuring two Flight Releasable Grapple Fixtures (FRGFs) – from Dragon’s Trunk. These “grapple bars” are used to aid in the handling of a stowed ISS radiator in a potential future replacement scenario, by adding grapple fixtures to the radiator for the Station’s arm to interface with. During the CRS-3/SpX-3, the High Definition Earth Viewing (HDEV) package, which comprises of four high-definition cameras, now streaming live video of Earth for online viewing, was removed from the Dragon, alongside the OPALS payload. 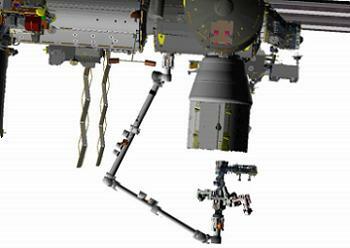 Trunk payload removal tasks are based on a complex series of procedures created by ground teams – as outlined in a Dragon robotics ops document (L2). 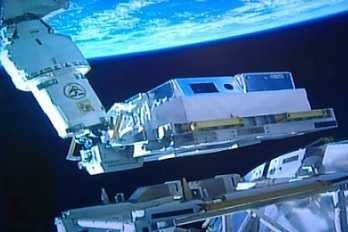 With the Dragon secure on the Common Berthing Mechanism (CBM), the MT (Mobile Transporter) translated along the Station’s backbone from Work Site 2 to Work Site 6 to support removing the two sets of research hardware. 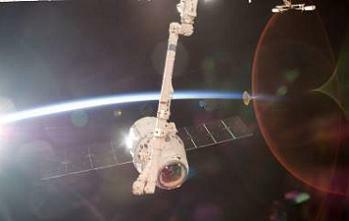 The SSRMS then released its grip on the Dragon, and collected Dextre from its staging point and translated over to the aft of the Dragon. The spacecraft’s Trunk was then surveyed using Dextre’s own LEE and Camera Light Pan Tilt Assembly (CLPAs), under the control of MCC-Houston. This task allowed for teams on the ground to assess viewing and lighting conditions, along with clearances, ahead of the cargo extraction tasks. With a GO to proceed, Dextre was carefully eased towards the open aft of the Dragon, with its sights set on removing the CATS package. Taking grip, the payload was eased out of the Trunk and translated over to the JAXA section where the Japanese robotic arm greeted Dextre for a handover. This marked the first time the two robotic assets had been involved in such an operation. It was conducted without issue. By the early hours of Thursday, Dextre had released its grip on CATS, leaving the final installation tasks to the Japanese arm. Meanwhile, Dragon is preparing to depart the ISS on February 10, potentially resulting in a splashdown in the Pacific ocean just two days after the next SpaceX launch. Another Falcon 9 v1.1 is currently scheduled to loft the DSCOVR spacecraft from Cape Canaveral’s SLC-40 on February 8, with the core stage from that launch set to conduct a second attempt at successfully landing on the Autonomous Spaceport Drone Ship (ASDS) in the Atlantic ocean. The launch date for the DSCOVR mission is – as always – at the mercy of a smooth processing flow, a successful static fire test (currently targeting January 31, per L2) and the approval of the Launch Readiness Review (LRR), prior to it being officially set.